There was a time when 90 horsepower was a lot, and that time was 1932. Fifty years later, it was bupkis, especially under the hood of Chevy's beloved Mustang-fighter, the Camaro. 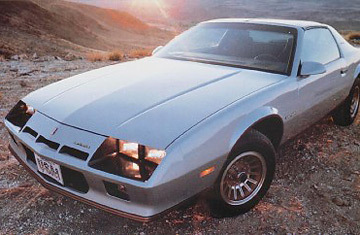 As the base engine for the redesigned 1982 Camaro (and Pontiac Firebird), the 2.5-liter, four-cylinder "Iron Duke" was the smallest, least powerful, most un-Camaro-like engine that could be and, like the California Corvette, it was connected to a low-tech three-speed slushbox. So equipped, the Iron Duke Camaro had 0-60 mph acceleration of around 20 seconds, which left Camaro owners to drum their fingers while school buses rocketed past in a blur of yellow.